Murrells Inlet lost one of its favorites today. Jessica Lynn Hill, owner/operator of Perry’s Bait and Tackle, was killed near her store after a man tried to burn down her establishment. Murrells Inlet is at a loss after the death of Hill. 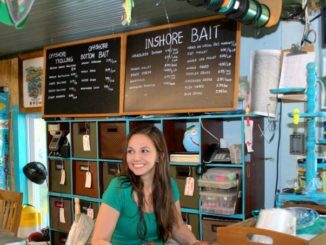 She will be dearly missed by her customers, friends, and the entire Murrells Inlet community. As a hair stylist, it’s not always easy for Nancy “Tootie” Morris of Rougemont, NC to make a living and make time for hunting. 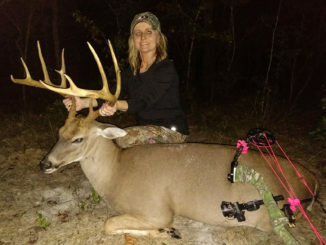 But, when her husband threatened to kill her buck — she cleared her schedule for the afternoon of Sept. 16 and took the 190-pound, Person County 12-point they had been watching since July. 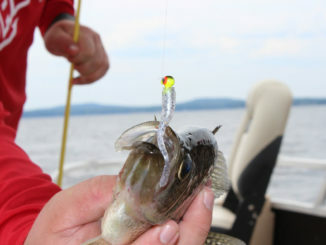 Guide Jerry Hill said striper fishing on North Carolina’s High Rock Lake really breaks loose around Oct. 20, with fish in the 10-pound class and above beginning to show up. 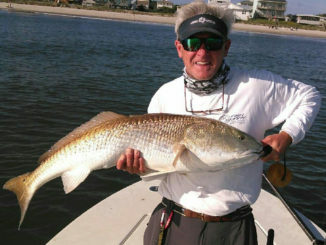 Fall fishing action fires off all over the South Carolina coast this time of year, but for big-fish action, you don’t have to go far from the beach. 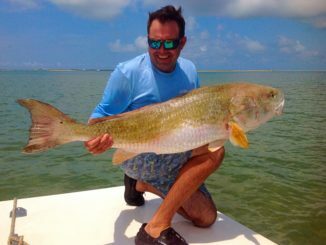 Big, bull redfish are heading out of inlets for the ocean, where they will spend the winter, making nearshore waters, especially those off the Grand Strand, prime areas to be brought to your knees by a strong fish. 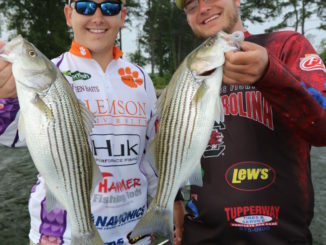 Guide of Joe Jobin of Xtreme Striper Fishing said fishermen can catch good numbers of stripers from North Carolina’s Lake Hickory, but just upstream, Lake Rhodhiss spits out bigger fish. Before there was a Cooyon Croaker, Kaplan-based Cajun Lures probably was best known for the little soft plastic that slayed sac-a-lait (crappie) here, there and everywhere. 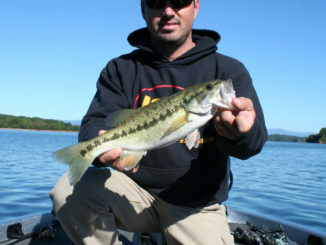 For a number of reasons, fall is a great time of year to go bass fishing on South Carolina’s Lake Keowee. Summer, with its almost intolerable heat and humidity, is just a bad memory as cooler fall temperatures prevail. 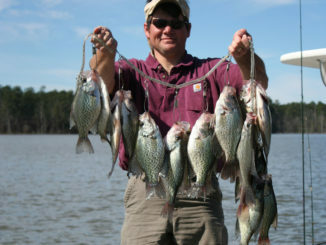 Fishing for crappie on South Carolina’s Lake Murray starts picking up in early October and gets better week by week through the fall until it peaks, usually around Thanksgiving, according to guide Brad Taylor. When October temperatures get nippy, guide Colt Bass of Colt Bass Fishing knows the impending cool-down will prompt the smallmouth at North Carolina’s picturesque Lake James to move from their deep, summer holes into shallower water to begin feeding up for the winter. 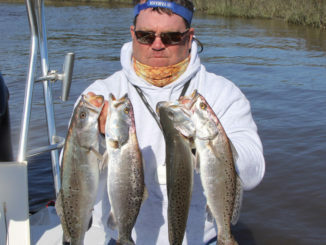 After months of hot, summer weather, the waiting is finally over, and anglers can celebrate the fall with excitement, and the waters surrounding Georgetown are some of the best places in South Carolina to slam a limit of speckled trout in record time. By October, most inshore saltwater species will have moved through the inlets along North Carolina’s northern coast and into the ocean, especially after the water begins to cool. 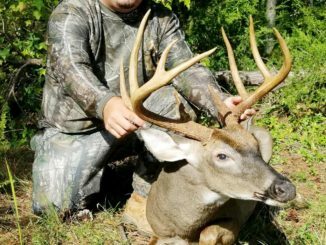 For years, James Lang of Gray Court, S.C. had hoped to kill a South Carolina record book deer, and when he started getting photos of a big 9-point buck on several of his Laurens County stands, he knew bagging the buck of his dreams was a possibility.